Height: 39.5 cm. Saint Petersburg, The State Hermitage MuseumInv. No. Б. 1485 (St. 50, Б. 180). Heracles strangling the Nemean lion; Iolaos, Athena, Mercurius. Inv. No. Б. 1485 (St. 50, Б. 180). 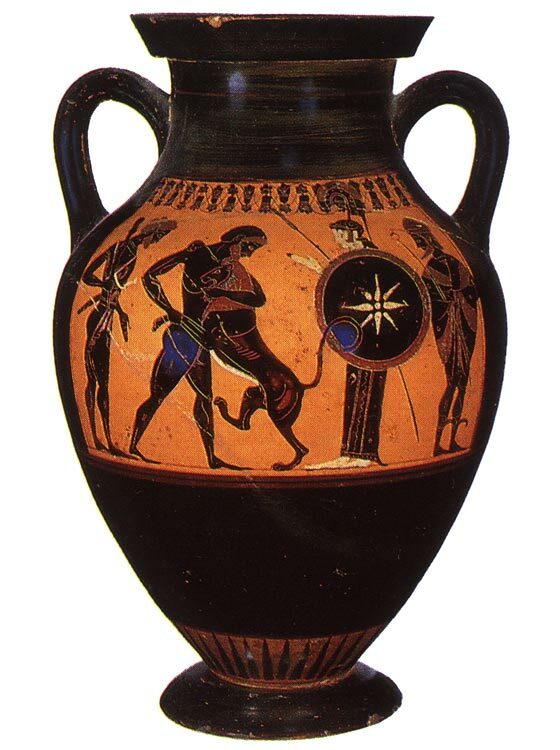 The centre of the vase features two javelin-throwers, flanked by two trainers. The bearded athlete on the left is carrying his javelin horizontally at head height, above his shoulder, and stretching his left hand forward. He will take a few more steps before taking up the throwing position. On the other side, a familiar scene: Heracles strangling the Nemean lion. The figure on the left is probably Iolaos; on the right is the goddess Athena. © 1993. Photo, text: Olympism in antiquity. Olympic Museum Lausanne. Bertelsmann UFA. Industria Gráfica S. A. Barcelona, 1993, p. 102 cat. no. 45.